I've been having some bonding issues with Jonas over the last year or so. She's gone through several style transformations and nothing has really stuck. Add that to her less-than-stellar posing ability (I have to turn her lower arms backward to get them to stay straight...) and small size and I was just feeling lost. 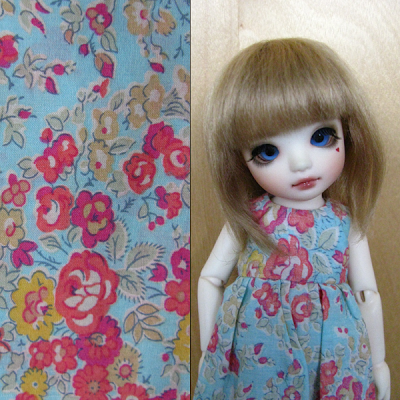 So, when I made her a dress from the fabric I bought at Liberty in London as a pattern tester for SM, I wasn't really expecting much... but it has completely changed my feelings for her. I now know exactly what her style is, which makes it so much easier to clothe and photograph her. Her character has been modified accordingly, and she's now a mix of the Jonas character and another I was initially considering for the Bonbon: Aria. This new style is very much how I envisioned Aria, so I'm hoping it will be easy to continue to come up with new pieces using the old sketches I have of her.